Take a gander as this video footage from our recent trip to Caineville. The boys and I had a great time riding our dirt bikes in this world class area. So far I am very happy with the new GoPro Hero helmet camera, although I am still getting use to the functions and battery life. You definitely have to keep fresh batteries in it and pay attention to what mode you are in to get it to work the way you want. The ultra wide 170 degree angle lens captures most everything that your eyes are seeing but also makes the vibrations seen on the final footage much less pronounced. 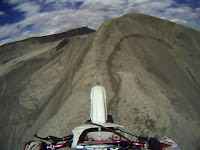 All the footage is taken using the camera in the high sound recording mode from either the front or back of my helmet. I guess it's not working on my laptop either. Becky put security stuff on our computers so we can't get to youtube. Wish I can watch it! Video is awsome.Thank you for sharing. Nice photos and vids. I really like it. You design is hot definitely hot.